With summer sun right around the corner, it's time to start thinking about long evenings sitting outside. But if you've got wooden garden furniture, you're going to have to do a little work before you get to relaxing. A little preparation beforehand, and the right treatment during the summer, should ensure that your wooden furniture lasts for years to come. No prior preparation though, and your wooden furniture can crack, split, and become useless. So follow the below steps, and you'll be able to protect your investment for the long term. Before we begin summer preparation, you're going to need to work on your furniture, and that means you're going to need plenty of space, and a nice day to work in. You won't be able to complete this process in the rain, so watch the forecast for a dry day. This is also best done on a hard surface, to prevent things getting muddy, so now would be a good time to sweep off that patio or deck! Now you're ready to start with your preparation. Preparing your wooden furniture for summer is a simple, four step process, and it should take you a day or two, depending on how much furniture you have to work with. Obviously things like benches, tables, and chairs will need preparing, but don't forget about other things, like that wooden bin cover or log store. 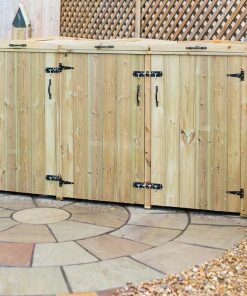 Things like garden sheds, which should be creosoted, should not need to be prepared for the summer (as long as their wood treatment or creosote coat is up to date!). Step One: Your first step is an easy one. Take a mild scrubbing brush (like the one used for fruit and vegetables in the kitchen) and give your furniture a dry scrub down. You're looking to get rid of surface dirt and dust as well as cobwebs and leaves, so you don't need water here. Don't forget to get under tables and underneath chairs, so that you've got the majority of the loose dirt off your surface. If you happen to have a leaf blower around, this makes clean up easy, if not, make sure you sweep the loose dirt off your patio before continuing. Step Two: Now you need to get a good washing in. You can start by just hosing off furniture with plain water. But for a real wash you'll need wood cleaner. You can buy this pre-made at your local DIY shop, though you can also make it yourself by mixing turps, linseed oil, and water. Avoid using dishsoaps or car washing liquids. You'll need to wear gloves when working, since wood cleaner is an irritant, and you can use the same scrub brush as you used before to make sure everything gets a good coating. When you're done, hose everything off again with plain water to make sure there's no cleaner left on the wood. Step Three: This is an important step, so don't skip it! You need to grab some clean rags and dry off the surface water, then leave the furniture in the sun to completely dry. If you don't do this then rotting or mould can occur as the moisture sinks into the wood. This is obviously a bad thing, so get as much water off as you can. Step Four: Once your furniture is dry, you need to apply a protective coat of oil to make sure your furniture will be able to withstand the sun and summer showers. Different kinds of woods need different protective oils, so read your manufacturer's instructions. Apply the oil you need onto every surface, a large paintbrush makes this easier, then allow to dry for a few hours. After a few hours in the sun, wipe off any excess oil with a rag. Your wooden furniture should now be ready to use in the sun. You might also want to do a quick maintenance check before using however. Look for cracks in the wood, for rotting, fungus, loose nails or screws, and fix as much as you can. If you find fungus or mould, then drop by your DIY shop for an appropriate treatment to stop these spreading. UV light is pretty bad for wood, whether it's been treated or not. Keeping your furniture out of direct sun whenever possible means that it'll last longer. In some cases this is easy. 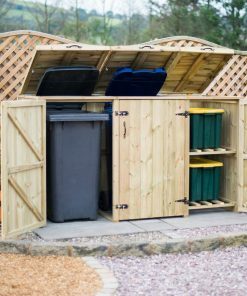 Situating your wooden bin store in a shady area is simple. With things like benches, tables and chairs, this is a little harder, but if they're not currently in use try moving them into the shade when you can. Even covering them up with tarps is better than nothing. Rain and moisture are also not great for wood. If it's possible cover up your wooden furniture when storms come or when rainy days are forecast. Cheap tarps and bungee cords will do the trick if you don't want to invest in expensive furniture covers. Alternatively, move smaller furniture pieces into the garage or out of the rain when not in use. Finally, don't forget that summer doesn't last forever! At the end of the season you need to protect your furniture from the coming bad weather. Covering wooden furniture is okay, but ideally, moving furniture indoors (into the garage or loft) is the way to go, since this will also protect it from freezing temperatures. Having wooden furniture certainly makes your garden and property look great. But it's important that you take care of your furniture properly in order to protect your investment. A little work before the summer starts, and a little care during the summer months, should be enough to make sure that your furniture always looks great, whatever the weather!